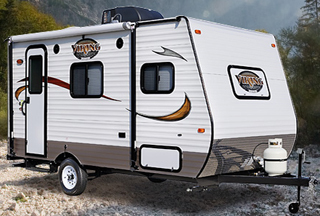 Carteret RV offers a wide variety of lightweight RVs such as X-Lites by Wildwood, Ultra and Super Light Outback RVs by Keystone and Viking Lightweight RVs. Wildwood by Forest River offers a wide variety of awesome X-Lite Travel Trailer Floorplans. The quality you expect. The luxury you deserve. Every Wildwood X-Lite is filled with all the comforts of home to ensure a pleasant stay at your favorite camping destinations. Start camping, TODAY! Whether you are looking for an outdoor kitchen, bunk beds or fireplace, we have a lightweight RV for you! 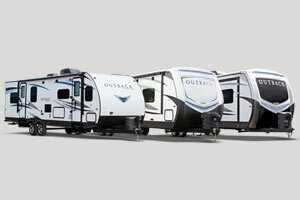 Outback RV takes comfort and style to a whole new level with Lite RVs for everyone. Vaulted ceilings and upgraded furniture provide a roominess and sophistication unseen in other light weight trailers. The combination of solid ash interior doors with walnut and hazelnut cabinetry delivers the styling that campers have come to expect from Outback. See for yourself how the Outback can make camping better than it has ever been. Created with the budget conscious family in mind, the Viking travel trailers provide an affordable family camping alternative without compromising the quality and comforts of the full size units. Weighing in at around 2500 lbs., the Viking is easy to tow and allows you to breeze by more gas stations than full size units. The Viking truly redefines Value when it comes to camping. Our inventory at Carteret RV is constantly changing. Choose from the models available here at the dealership or special order the right one for you.